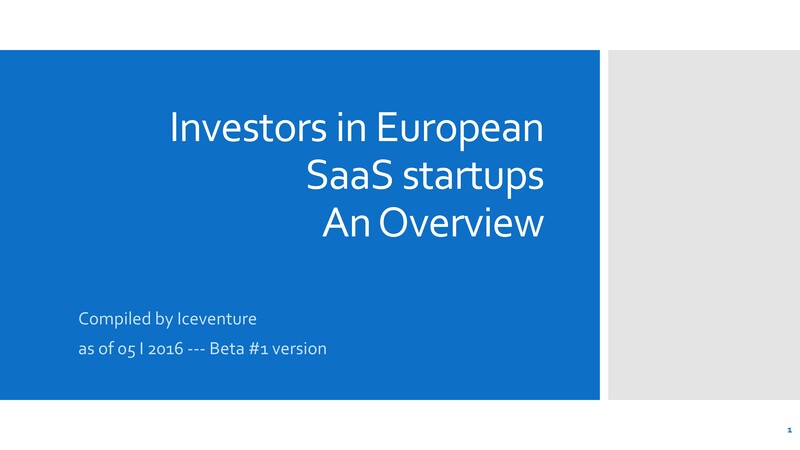 We updated our overview of investors in European SaaS companies. The good news is - also for this update we find an increasing numbers of Europe based SaaS only VCs as well as US veterans investing in Europe. In addition, many funds invest at least parts of their portfolio in Software as a Service in Europe. This does not make it easier to start and scale a SaaS business to €100 M in Europe, but at least it is a starting point. If you know an investor that is missing, drop as a line or a comment. I plan to update the list in intervals. I have been asked the questions many times in the last years: SaaS in Europe in principal a good idea, but who invests in them? The good news is, there has been quite a change as we find an increasing numbers of Europe based SaaS only VCs as well as US veterans investing in Europe. In addition, many funds invest at least parts of their portfolio in Software as a Service in Europe.